If you’re a Nonchalant London regular you’ll know how much we bang on about art and our love for new prints. You will also recall that we partnered with Art Republic and Ben Eine around his incredible work. 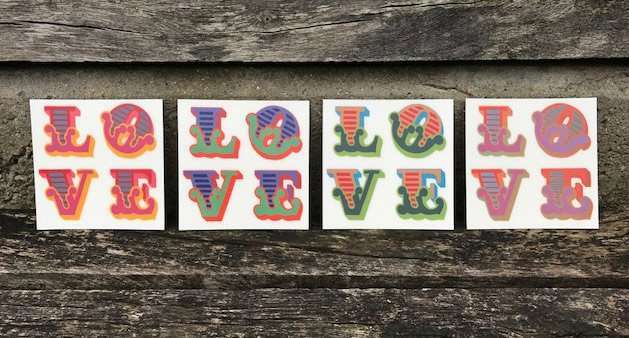 You’ll see Ben Eine’s work all across London in the form of vibrant typographical letters. We’ve just received these incredible prints from Art Republic and felt the need to shout about them. �Love Lenticular’ come in both black and white and are a set of 4 Lenticular post cards. Each post card measures 15cm x 15cm and come signed by the artist. These incredible signed post cards have great colour depth and movement with the Lenticular technology. Lenticular printing is a technology in which lenticular lenses are used to produce printed images with the ability to change or move as the image is viewed from different angles. We’re extremely chuffed to add these to our ever growing art collection and we think you should do the same while they are available.